after a very long 27 hours of traveling and waiting, the time machine has finally landed us in the future in australia, where it's sunny, warm, and the ocean is blue! here it is 11pm on thursday (that's 9am eastern, with no sleep since tuesday, which was actually yesterday, as wednesday doesn't exist for us). yeah, i don't get it either. we've experienced driving on the wrong side of the road (which they say is the right side, but how can the left side be right? ), the pacific ocean from *this* side, some odd birds i can't remember (no sleep you know), shopping with lauren (we do that in every country and state! 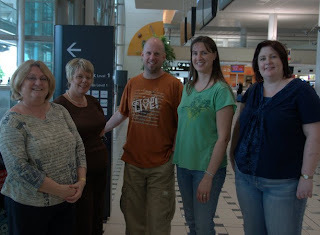 ), met robyn, erica, janp, kim (yvspeck) and don. tomorrow we'll get up super early (lauren says so) to visit currumbin wildlife sanctuary (snake warning! ), where we hope to feed kangaroos and hold koalas! 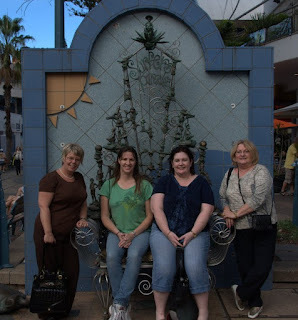 here are pics from today, in the brisbane airport, then surfers paradise, queensland, australia. will post more pics soon, after a few hours sleep! Can't wait to see more of your trip! What an amazing experience! Enjoy the sun and warmth while you are over there. Not much of either here :( Have fun at Currumbin! OMG! Sounds like you're having fun already! Happy travels!